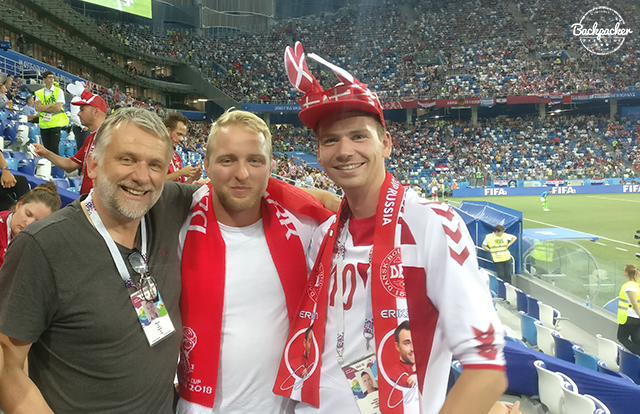 Yesterday Lasse and I attended the ever-crucial Round of 16 at the Fifa World Cup 2018 in Russia. 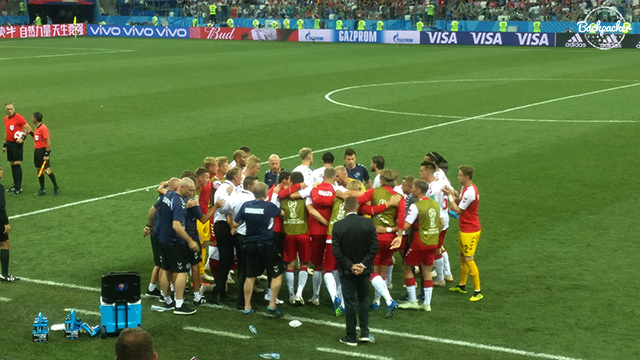 Denmark had advanced from the group in second place, which meant facing a strong Croatian team in this knock-out stage. 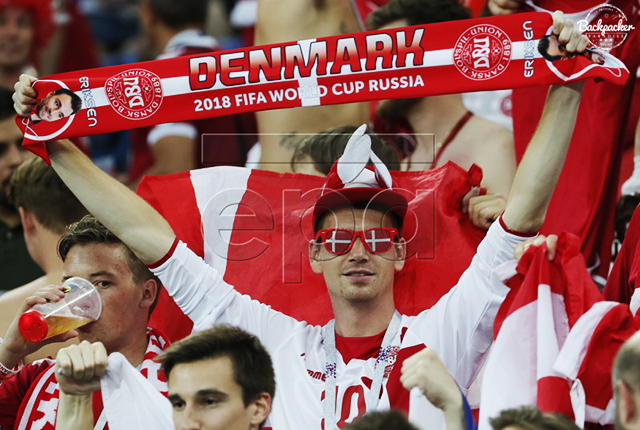 Due to a delayed flight, the players family, friends and officials, politicians and other VIPs hadn't made it from Denmark to Nizhny Novgorod Stadium. 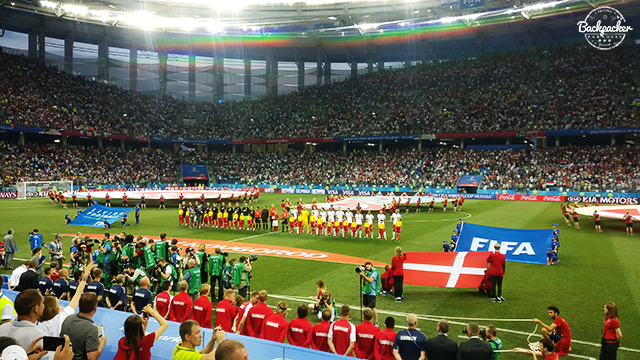 DBU (the Danish Football Association) decided to trade our low-price tickets to the best seats in the whole stadium. We didn't complain. At the stadium we ran into an old acquaintance; Ove. We met during our visit to North Korea back in 2015 and suddenly we were seated just a row apart at a stadium in Russia. The match was one of the most nerve-wrecking I've ever witnessed. But after just 1 minute of time, Mathias "Zanka" Jørgensen found the back of the net; 1-0! 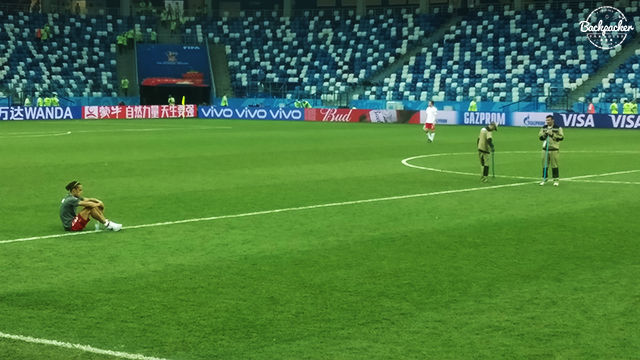 We couldn't believe what just happened, but just 3 minutes later Croatia's Mario Mandzukic took us back to Earth; 1-1. 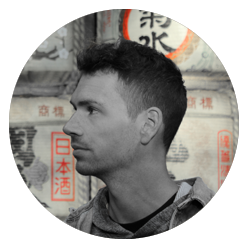 The game developed in a nervous direction and everybody had a feeling this could go either way. The game went to extra time and in minute 116 Croatia got a penalty. Unbearable, we thought we'd lost right there and then. But who else than Kasper Schmeichel would step up now? He denied Luka Modric the position of match winner. Extra time ended. Penalty shoot-out would now decide which team would advance into the quarterfinals. But with Christian Eriksen, Lasse Schöne and Nicolai Jørgensen all missing their shot, Croatia could cheer, while the World Cup 2018 came to an end for our small nation. William Kvist played his last game for the national team that night. He walked restlessly around the pitch after the last whistle. Yussuf Yurary Poulsen just sat there for a solid 20 minutes starring into emptiness. 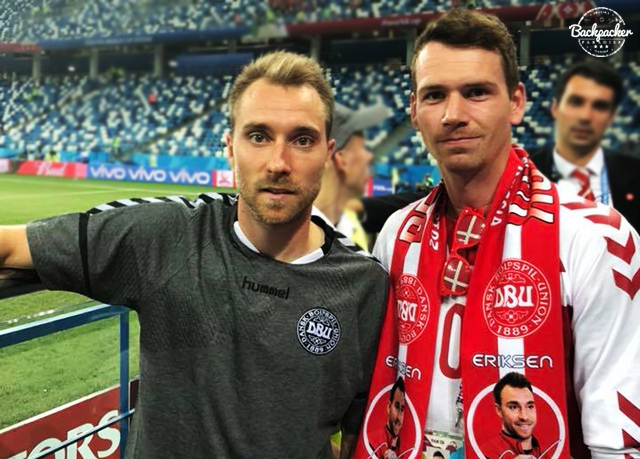 Christian Eriksen join the remaining fans on the stands. He just sat there for awhile with us, realizing the vast space left after such a thrilling game. We had actually made a short stop in Nizhny Novgorod before the match as we were headed towards one of the other host cities. But a second visit was most welcomed as the city with a population of more than a million people had quite a lot to offer. 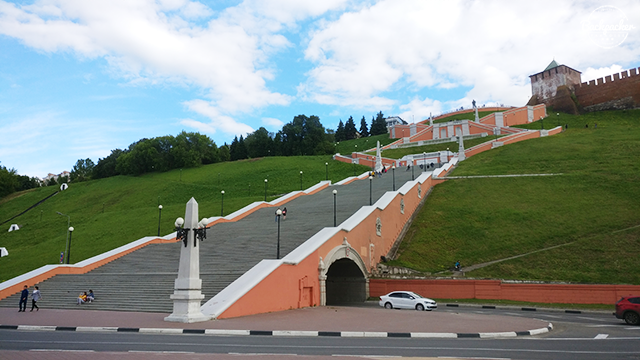 Chkalov Stairs is without a doubt the main attraction in Nizhy Novgorod. 560 steps (if you count them all) forms this symmetrical and beautiful masterpiece of an architectural structure. At the top there's a great view over the Volga River and the kremlin wall runs right next to it. Speaking of, the Nizhny Novgorod Kremlin is visible from several places near the city centre. 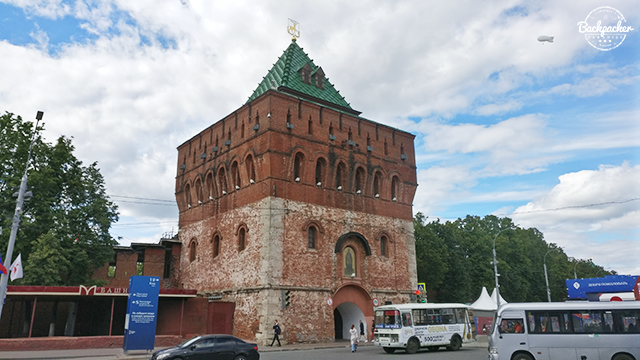 The very recognizable towers are places strategically throughout the city and remains major landmarks in Nizhny Novgorod. The Volga River is the longest river in Europe and regarded as the national river of Russia. Obviously it can be seen from several cities throughout the country as Nizhny Novgorod is one of those cities. 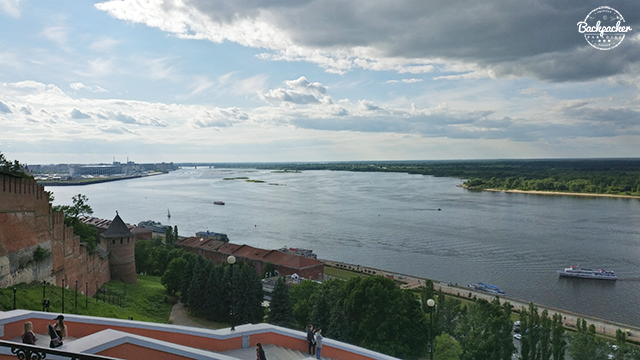 At the top of the Chkalov Stairs the view over the Volga River is quite spectacular. 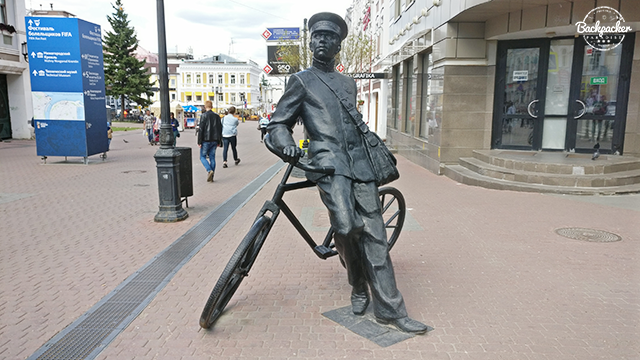 Monument to the Postman in Nizhny Novgorod, Russia. Bolshaya Pokrovskaya Street is the main street in Nizhny Novgorod city centre. Restaurants, shops, bars and much more are located right here. It runs from Maxim Gorky Square all the way to Chkalov Stairs and a stroll up and down here is not to be missed. The street is also full of art - from statues to murals and wall paintings. The atmosphere surrounding this area is what makes Nizhny Novgorod so special and cozy. Lenin Square is located on the west side of the Oka River and of Nizhny Novgorod. 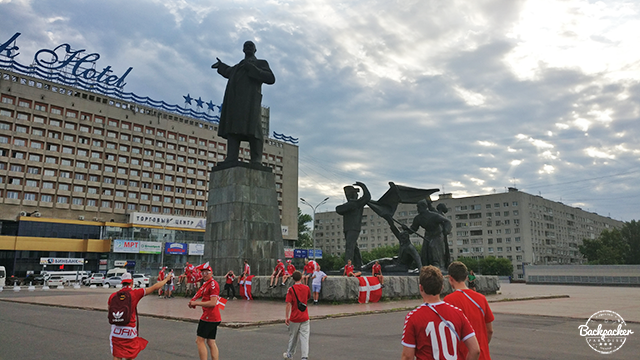 The square functioned as a gathering point for the Danish fans before the match against Croatia at the Fifa World Cup 2018 in Russia. 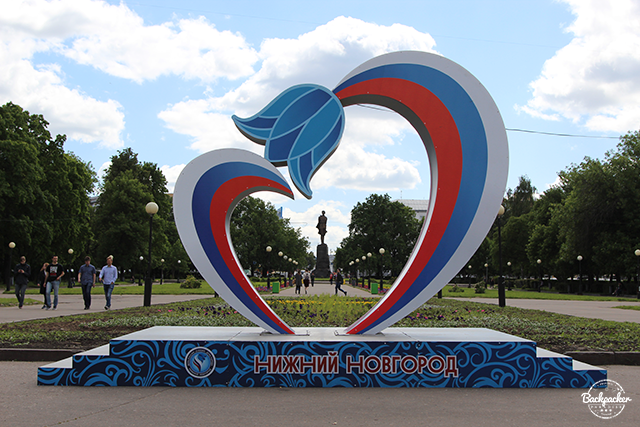 Maxim Gorky Square marks the beginning of the main street in Nizhny Novgorod city centre. A large statue of Gorky has been erected and it seems to be a place where locals hang out. 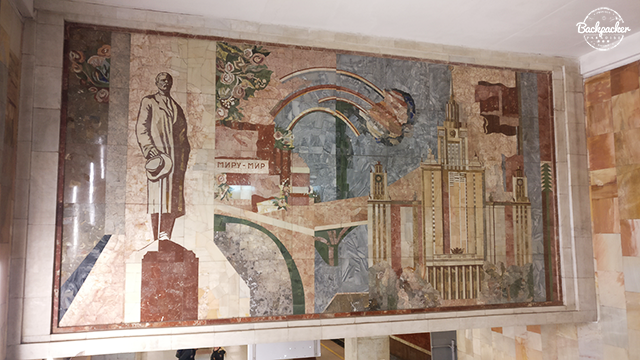 Like many other train stations in Russia the main station in Nizhny Novgorod is heavily decorated in art. 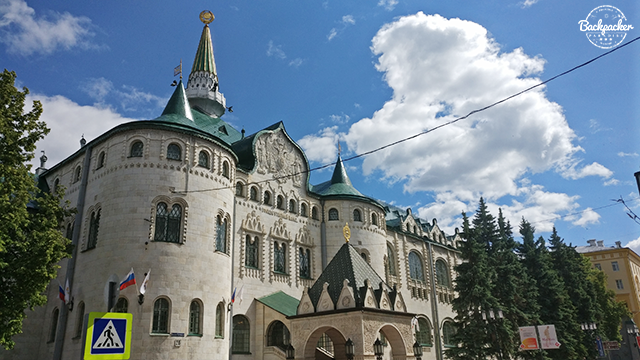 The Russian railway is quite something and a visit to Russia without riding the long distance trains is not complete. Lastly I'll mention the Bank Rossii in Nizhny Novgorod. I mean, have you ever seen a bank looking like a freaking Disney-castle before? Me neither. Go check it out.